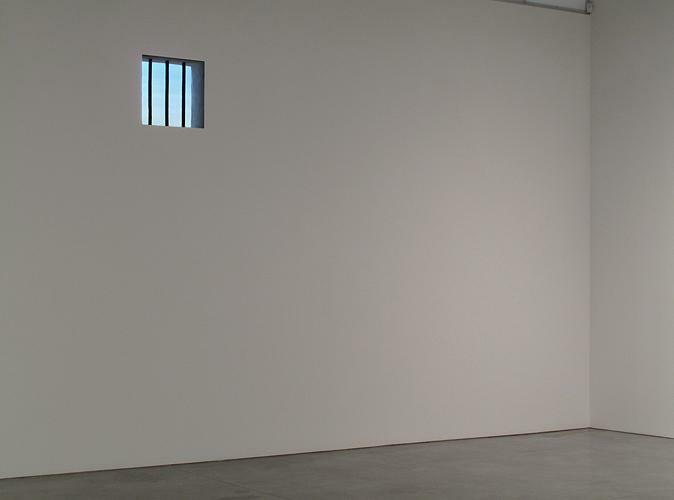 A Shadow Leaving an Object pairs Robert Gober's Prison Window, a barred window looking out to a swath of blue sky, with Felix Gonzalez-Torres' "Untitled"(March 5th) #1, a pair of mirrors, identical and round, set together, flush with the wall. Both works are embedded and never cross the threshold of the wall, thereby rendering the room technically empty. Viewers become the only physical presence within the room. The works open portals to spaces outside the four walls (beyond the window, inside the mirror), as well as simultaneously becoming backdrops for both real and theatrical experiences. Viewer is audience and player, observer and observed. Installed on opposite walls, one faces only a single work at a time; the other is always behind, seen only in reflective glimpses or in memory. Looking at the barred window, gallery could be cast as cell. In that interpretation, the exhibition becomes a setting for a play about the nature of freedom and imprisonment, recalling Sartre's No Exit. Yet, the roles are constantly recast. Standing before the window, the lines between judge and judged, actor and audience fade under the light it casts. As Genet questioned, when considering the strange biology between judge and prisoner, "who is the sun, and who is the shadow?" On the other side of the room, the mirrors present another vantage from which to watch and engage. Before them, one is at once viewer and subject in the dizzying infinity between two mirrors. (Or as John Ashbery described the view within such a mirror, "the reflection, of which the portrait is the reflection, of which the portrait is the reflection once removed.") The two mirrors, the invocation of a couple, question the nature of self-perception and its relationship to another. Looking at your own reflection, is the space beside you an absence or the possibility of a presence? Both works reference traditional metaphors of the art object: window and mirror. Yet they actualize their metaphors, transcending tropes. The pairing becomes a physical dialogue on a topic more often associated with the history of painting. Painting, as an illusory space on a flat plane, has often been metaphorically described as a window and a mirror. "Untitled" (March 5th) #1 recalls Parmigianino's Self-portrait in a Convex Mirror, yet actual mirrors cast the viewer as subject. More abstractly, the two mirrors recreate the psychic fracturing of Manet's A Bar at the Folies-Bergère. Subject and viewer interchange, reality and illusion double, and temporal space expands beyond the mirror. Similarly, Prison Window plays off the Renaissance concept of painting as window. Building from Magritte's The Human Condition or The Promenades of Euclid, Gober manifests the window, sets the painting beyond the wall, and interchanges reality with painting, in a literal retelling of Magritte's pun. "Once illusion is sacrificed to free discussion, and once the spectator, instead of being enabled to have an experience, is forced as it were to cast his vote; then a change has been launched which goes far beyond formal matters and begins for the first time to effect theatre's social function."